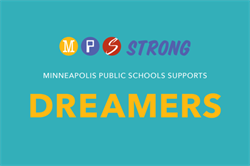 “Minneapolis Public Schools, like many school districts, organizations and businesses in Minnesota and nationwide, is made better by the immigrants who work and learn in our schools. Many of these immigrants, often referred to as “Dreamers,” came to this country as children and have benefitted from the Deferred Action for Childhood Arrivals (DACA) order signed in 2012. DACA shields young undocumented immigrants from deportation and its recipients have been allowed to obtain valid driver's licenses, enroll in college and legally secure jobs. We are gravely concerned and stand with the leaders of many large urban school districts around the nation in speaking out against today’s White House announcement that the DACA program will be ended — whether now or in six months. We join with those leaders in asking Congress to act quickly to pass legislation to protect the DACA provisions and remove the uncertainty facing so many of our students and families. Today I know that many MPS employees, students and families are experiencing fear, uncertainty, anger and disappointment. Please know you continue to have the support of MPS as the implications of today’s announcement unfold. Please know you can come to work or school tomorrow and receive the same support and educational services that you did before this decision was announced. We continue to believe the words of our Board of Education, which stated in January that the role of a school district is not to ask about the citizenship or immigration status of any of its students or families. Our role is to educate students and we can only do that if our students and employees feel safe. The Immigrant Law Center of MN operates an Immigrant and Refugee Rights Helpline to connect community members with a free legal consultation. The Helpline is available for immigrants and refugees living in MN whose household income is below 250% of the federal poverty level. Flyers with more information are available in English, Spanish, and Somali (PDF). Mid-Minnesota Legal Aid offers free civil legal assistance to low-income community members in many areas of law, including immigration. Directory of Immigration Legal Services in Minnesota from the Immigration Advocates Network"